Professor Ian Kershaw, best known for his landmark two-volume biography of Adolf Hitler (titled Hubris and Nemesis) takes on a gargantuan project in To Hell and Back: Europe 1914-1949, a history of the European continent’s 30-year collapse into near self-destruction. A history encompassing the politics, economics, and high and low cultures of nearly two-dozen countries, from Ireland to Russia and from Norway to Greece, cannot hope to be comprehensive, and, given its satellite’s eye perspective, is unlikely to provide the kinds of revolutionary ideas—like Kershaw’s theory of “working toward the Fuehrer”—that make a historical work a landmark. But Kershaw doesn’t let his book’s scope confine him to merely narrating the period’s important dates and events. Instead, he starts with an analytical framework, a set of four trends that Kershaw sees as crucial to understanding why Europe spent three decades attempting suicide—committing several genocides along the way: rising ethnic and racial hatred, nationalist greed for new or revised territorial boundaries, class conflict arising from rampant inequality, and a crisis of capitalism for which Europe’s established political institutions lacked a convincing response. Not only in response to the perceived threat from left wing governments, but also to help governments with little or no mass backing to widen the base of their support, populist counter-movements emerged. These were often sponsored directly or indirectly by industrialists or landholders, keen to deflect potential class-based opposition into more controllable channels. This drive to turn the lower class’s anger away from those at the top extended to whipping up fear and hatred of foreigners. The late 19th century gave birth to the word “jingoism”, legitimized a pseudo-scientifically based antisemitism, and unleashed genocidal violence on Europe’s colonial possessions, particularly in China and the Congo. What makes Kershaw’s rendering of this history so compelling is that, despite his focus on his four dominant trends, he still depicts history as it generally is, messy and contingent, a series of well-intentioned failures, unlucky breaks, foolish gambles, own goals, good ideas that went undeveloped or unheard, and bad ideas that seemed like the best ideas at the time. Kershaw’s Hitler and Mussolini, Chamberlain and Churchill, Wilhelm and Lloyd George, Nicholas and Lenin, Franco and Stalin, Keynes and Heidegger appear as both makers and prisoners of history. The traditions of all dead generations weighed on their heads as they made their decisions. When they goofed, it was often because they still held to discredited ideas or misplaced feelings of national pride. When some of them, like Keynes, came up with ideas that might have saved Europe, or at least mitigated the worst of its problems, few were willing to listen until crisis had become cataclysm. 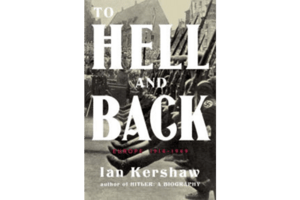 Reading Ian Kershaw’s To Hell and Back won’t help us avoid the precise catastrophe that nearly destroyed European civilization in the first half of the last century. That economic, political, and moral disaster was born out of its own peculiar circumstances and pressures and is unlikely to be replicated. But it’s hard not to see that the same trends that aroused passions in Europeans of 101 years ago working in our own time, in their own ways. Contemporary economic and political elites also have a penchant for using xenophobic propaganda to keep the masses from questioning the status quo. While the American and European far right rails against racial, ethnic, and sexual out groups, Western governments, in thrall to the discredited policy consensus of austerity, fail to address the widening inequality in global capitalism, condemning a generation of young workers to a poorer financial future. Add to this a global climate crisis that the world’s powers, more interested in short-term self interest than long term collective survival, are too slow to confront, and it’s possible to hear history rhyming. Eighteen years ago, Ian Kershaw was the consultant on Laurence Rees’s outstanding series The Nazis: A Warning From History. What Kershaw has written in To Hell and Back, besides a compelling historical narrative, is another warning, one just as vital to read. Viking Press sent me an advance copy for review. Next: Next post: How Corrupt Is Your Country?